The latest issue of Eurohistory. The European Royal History Journal, issue CXI, volume 19.3, fall 2016, which I received two weeks ago, has on its front cover a photo of the late Queen Anne of Romania, née Princess of Bourbon-Parme. 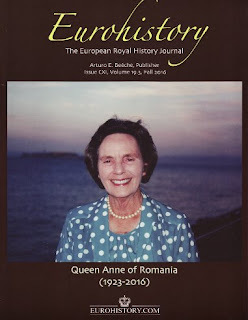 An obituary of the queen, who died on 1 August 2016, is published in the magazine, written by its publisher and editor Arturo E. Béeche. Queen Anne was married in 1948 to King Michael (Mihai), who rather unvoluntarily abdicated the throne of Romania the previous year. Traditionally each issue of the ERHJ includes a photo article written by Ilana D. Miller, and this time her Who Is In the Photograph presents a photo of The Battenberg Brothers, i.e. Prince Alexander of Bulgaria (1857–1893, r. 1879–1886), Prince Louis (Ludwig) (1854–1921), Prince Henry (1858–1896) and Prince Franz Joseph of Battenberg (1861–1924), sons of Prince Alexander of Hesse and by Rhine (1823–1888) and his wife Julia von Hauke (1825–1895), who was created Countess of (von) Battenberg when they married in 1851 and in 1858 Princess of Battenberg with the style of Serene Highness. Alexander and Julia also had the daughter Marie Caroline (1852–1923), who married Prince Gustav of Erbach-Schönberg (1840–1908) in 1871. The article is based on the talk Miller gave at the XIX Eurohistory Conference in September 2015. The Battenberg article is followed by Ludmila Prokopova's presentation of the Livadia Palace at Crimea, the former summer retreat of Emperor Nicholas II of Russia. The article is titled Tours to Imperial in the 19th Century. In 2016 it was 110 years since King Christian IX of Denmark (1818–1906, r. from 1863) died. This is probably why Coryne Hall has contributed with her article APAPA. King Christian IX of Denmark and His Descendants. King Christian has been nick-named «the Father-in-Law of Europe» due to the great dynastic matches two of his daughters made – Princess Alexandra, who married the Prince of Wales, later King Edward VII, and Princess Dagmar, who married the future Emperor Alexander III of Russia and became Empress Maria Feodorovna. His eldest son Frederik became King of Denmark, his younger son Prince Wilhelm became King Georgios I of the Hellenes, while his grandson Prince Carl was elected to the throne of Norway in 1905 and took the name Haakon VII. Descendants of Christian's children, who also included Princess Thyra, who married Ernst August of Hannover, Duke of Cumberland, and Prince Valdemar, who married Princess Marie of Orleans, are spread into the courts of Europe. Reigning descendants today include Queen Margrethe of Denmark, King Harald V of Norway, Queen Elizabeth of the United Kingdom, King Felipe VI of Spain, King Philippe of the Belgians and Grand Duke Henri of Luxembourg. Coryne Hall and Arturo E. Beéche's book APAPA: King Christian IX of Denmark and His Descendants was published by Eurohistory in 2014. On 8 October 2016 Prince Leka of the Albanians married his long-time fiancée Elia Zaharia in Tirana. Seth B. Leonard was lucky to be present and he has written a nice account of his impressions for the ERHJ. The wedding was also covered by Netty Leistra in the latest issue of Royalty Digest Quarterly. The ERHJ also includes a second obituary, that of Marco de Hohenlohe-Langenburg y Medina, the 19th Duke of Medinaceli (1962–2016), also written by the editor, Arturo E. Beéche. The last main article in the latest issue is written by Joe Spiteri and is titled The Royal Governor of the Rock of Gibraltar. The only royal person to be governor of Gibraltar was Prince Edward, Duke of Kent (1767–1820), the fourth son of King George III and Queen Charlotte, née Princess of Mecklenburg-Strelitz. British Nannies and the Great War by Louise Heren (Pen & Sword, 2016), ISBN 9781473827530. The first and fourth and fifth titles are thankfully also available as e-books. The ERHJ also includes a Royal News section, this time with news from the royal, princely and aristocratic houses of Albania, Luxembourg, Norway, Prussia, Serbia (Yugoslavia), Isenburg, Stolberg-Stolberg, Wurmbrand-Stuppach, Medinaceli and Westminster.